All you need to begin is some yarn and a crochet hook. 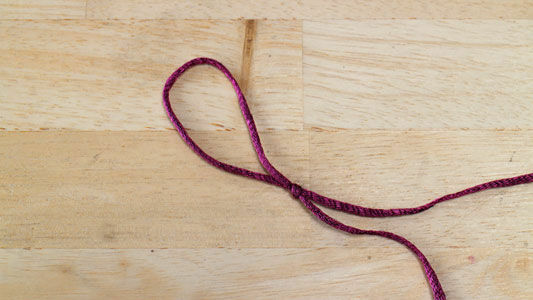 Step 1: Make a Slip Knot. 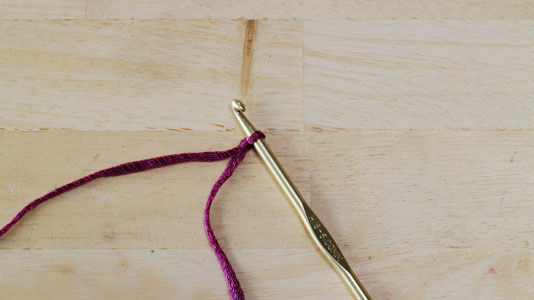 Begin the slip knot by laying the yarn down and looping it. Making sure your short piece, the tail is on top of the long yarn. Next, flip the whole thing down, onto the longer yarn. 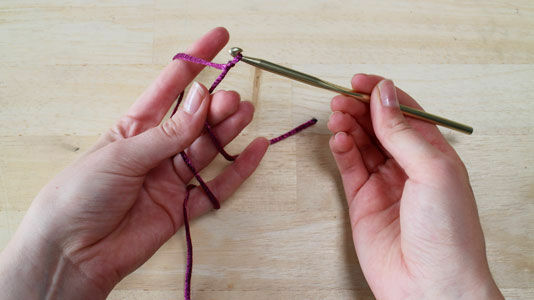 Grab the middle yarn between your thumb and forefinger and pull the middle yarn out gently. Hang on to tail and pull the loop tight. Pick up the loop in your left hand and slide the hook into the loop and tighten the loop around the hook. Not too tight, there should be some give. Note: I started out life left-handed and am now ambidextrous. I prefer to teach the way my nana taught me because it's how all the books are published. 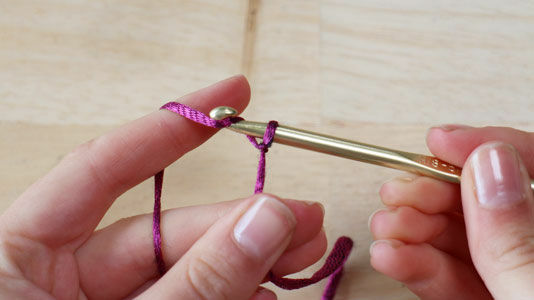 Turn the long side of the thread around your pinkie and twist it around your index finger. Grab the short side, the tail, with your middle and ring fingers. Hold the hook in your right hand. This way of holding the thread and hook will create enough space to move the hook and it keeps tension on the thread. There are multiple ways to keep your thread and hook, find out what works the best for you. 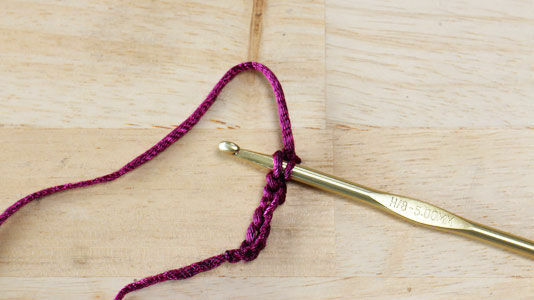 Begin with the starting chain stitch by twisting the thread around the hook and pull it through the loop. Don't make the loop too tight and continue to the second loop by pulling the thread trough the second loop. Keep continuing until you have a chain. 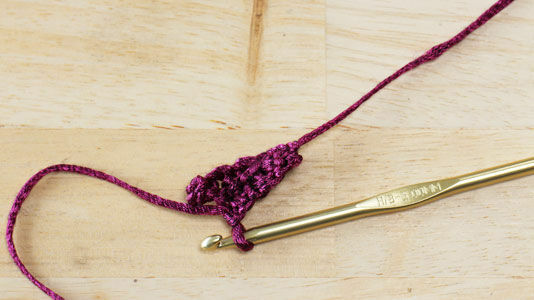 To start the first row of single crochet insert the hook in the second chain from the hook. You now have two loops on your hook. 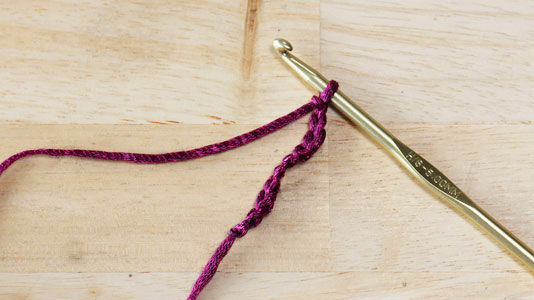 Catch the yarn in your left hand with the hook and pull it through the first loop. This will leave you again with two loops on your hook. Catch the yarn again with your hook and pull it through both loops. Repeat these steps until you get to the end of the chained row. To crochet more rows, chain one stitch at the end of each of the end of your row and turn your crocheting over to start the next row. To finish, cut the long side of the yarn and pull it through the loop. Remember, it doesn't matter what you're crocheting, it only matters that you're doing it!